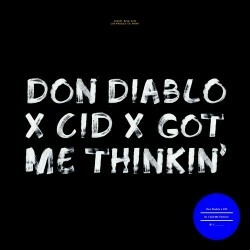 Don Diablo & CID – "Got Me Thinkin'"
The only thing I'm ever sure of with a Don Diablo song: it's going to be a high-quality, dance floor number. Other than that, the Dutch electronic artist makes sure to mix it up, having a range of sounds that run the gambit of electro to house. A radio edit teaser for his track "Got Me Thinkin'" went up last week, but today we have the pleasure of listening to the song in its entirety. The collaborative work, an effort with the new American artist CID, really wins you over through subtle nuances; it bypasses the brash boldness of "Starlight" and instead wows a listener through ringing percussion, mellow vocals, and a true house vibe. Grab the track on Beatport from Steve Angello's X imprint. CID has appeared from relative obscurity to produce two huge tracks: today's and last weeks big room adventure known as "Never Come Close" with Cedric Gervais. Keep an eye on this guy. As for Don Diablo, know that he always has a few big projects in the works.